Improved search features: Autocomplete search box, Date Range Searching, search by site: or URL:, and even better customizability. Indexes more formats! All editions (including Free Edition) will now index everything from Word and PDF documents, to PowerPoint, Excel, media (video/image) formats, e-mail formats, and many more! 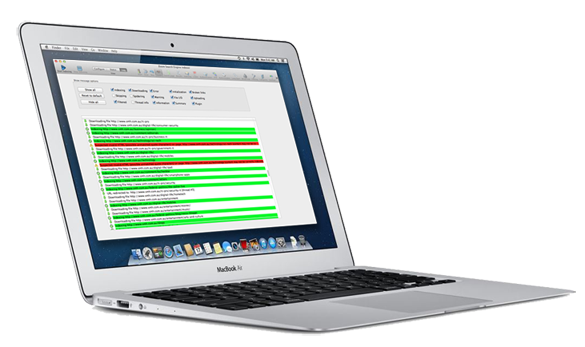 Cross platform solution: You can now index from Windows, Mac OSX, or Linux! V7.1 is now released with 12x increased indexing capacity and up to 5x performance gain! Read more here. Zoom V7 is the most powerful version of Zoom yet. Featuring autocomplete search box, date range searching, URL indexing, search by site, greater customizability, an overhauled interface, SSL and HTTPS spidering indexing support and indexing support for additional file formats. This is the most powerful version of Zoom yet. Zoom is both easy to use and still one of the most feature packed solutions on the market. 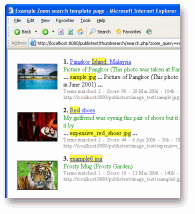 It offers search results sorted by relevance or date, wildcard searching, exact phrase matching*, "Google-like" context results*, highlighting, spelling suggestions, synonyms, graphical statistic reports, international language support, incremental indexing, images and thumbnails, content filtering, XML/RSS OpenSearch output, Stemming options to provide more accurate results, native ASP.NET server control, powerful Custom Meta Fields feature for database-like search criterias and more. New V7 features include autocomplete search box, date range searching, indexing support for email file formats, URL indexing, "Google-like" search by site search syntax, support for additional file formats (e.g. OpenDocument, media files). More about V7. Besides helping your visitors find what they're looking for, Zoom also provides features which are crucial to every web site administrator such as Broken Link Detection, Graphical Statistic Reports, and Google™ and Yahoo™ Sitemap Generator. Zoom uses its propriety-ranking algorithm to return results based on relevancy, and I have to confess that its scoring system surprised me. I compared the order of results as returned by Zoom against that of Google custom search for the test site that I indexed, and they're ranked pretty well in the same order. Whatever secret sauce they've cooked into their application, Zoom did an excellent job of addressing relevancy where many competitors failed. You can see Zoom in action via the search box at the top of this very page or on our search page. Our product tour and screenshots pages shows you how easy it is to setup and install search on your own website. You can also visit other Zoom users' websites from our example sites list.